Shalina Resources Ltd has a well developed and focused exploration program, which provides a strong platform for long-term growth. 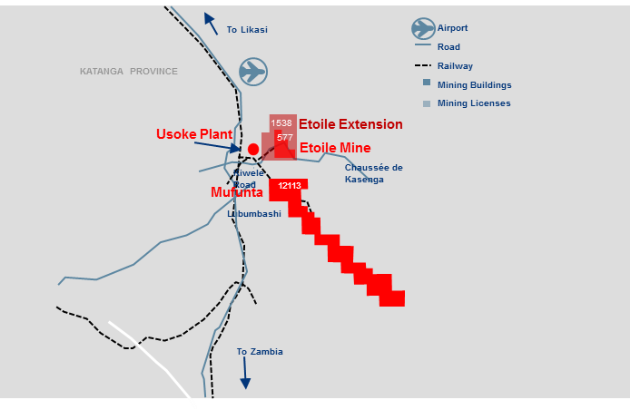 The company holds two licenses close to the Etoile mine; the Etoile Extension (license 1538) and Mufunta (license 12113). It has a well-developed exploration programme for these two licenses, as it looks to source new deposits to feed its Usoke processing facilities. The exploration strategy is key to the Company's focus on downstream activities, with a strong commitment to creating value within the DRC. The company is following a systematic exploration programme focused on Etoile Extension and Mufunta, that are likely to provide open pit mining opportunities. Through targeted drilling programmes the Company is aiming to significantly increase its resource base and add additional capacity to its existing mining operations. Systematic reconnaissance and preliminary geological surveys are planned and executed annually. Geochemical Surveys (in stages) are conducted to obtain the anomalous signatures of mineralization for identification of potential targets. Strict QA/QC standards are followed for data collection, data validation and documentation for deposit characterization, as per standard code (JORC).